Etsy Germany Street Team: Welcome to the Etsy Germany Street Team Blog! Welcome to the Etsy Germany Street Team blog. 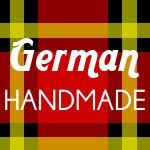 This blog serves as a presence on the web to showcase and highlight members of the Etsy Germany Street Team - Etsy sellers that are either based in Germany or one of the German-speaking countries and/or are German speaking. Our team goals are to promote each other's work, exchange knowledge and be an active part of the Handmade and Craft scene in Germany. We are a bi-lingual group (English, German and maybe sometimes a little Germisch or Denglish :-) and welcome comments and posts in either language!